Last time I talked a little about how I got to work in this industry, and mentioned I was lucky enough to land a commission in Snow White, a hardback edition of the critically acclaimed adventure from AAW Games. Snow White is a tale we all know—at least the Disney version of it—but the talented writers at AAW Games have taken a new twist on the story, while keeping true to its Hessian roots. In this article I’ll talk mostly about Snow White, but also about how I approach cartography in general. 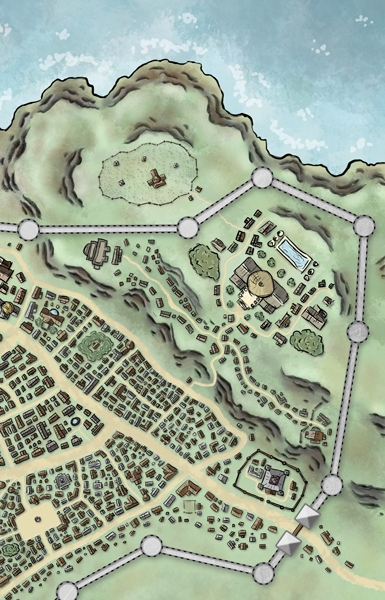 My involvement with the project started before the Kickstarter launched as I drew two stretch goal maps for it, a treasure map styled sketch of the town of Morsain, and an isometric map of the surrounding region where the adventure takes place. The fun starts when the stretch goals start kicking in—there are quite a few of those with my name on it! My approach on mapping a project is typically always the same. First I read the product, then plan on what style I want to use in it—maybe try few different styles first—and then start to sketch. Most of the time the client has a specific style in mind already, but Jonathan G. Nelson from AAW Games often gives me pretty free hands and doesn’t restrict me artistically (and I respect that immensely). When it came to Snow White, I wanted to embody that magical fairy tale feeling in maps too and isometric maps are great for this kind of product. It’s certainly possible to make top-down maps in a style suited for fairy tales, but with this style of cartography it’s an easier transition. Isometric maps are more personal and have that feeling of adventure no matter what style they’re drawn in—I remember seeing some as a child and imagining myself adventuring in those locations. If we think about isometric vs. top-down in regional maps, there are many times where isometric maps come in handy. For example, in Snow White there is a large haunted forest near the town where the adventure begins. 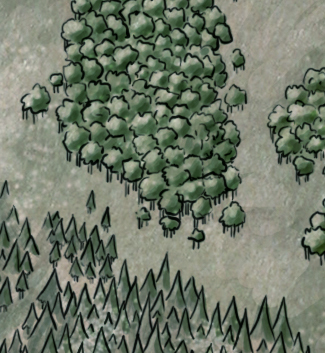 As a top-down map I’d draw it with trees, thick bushes, and round shapes, but with isometric I instead make the forest evergreen, drawing sharp and dark spruce trees to really emphasize on the haunted aspect of the area. In my mind the key to a successful illustration—especially a map—is attention to details and patience. In cartography patience is needed as it’s often needed to draw the same thing hundreds of times. 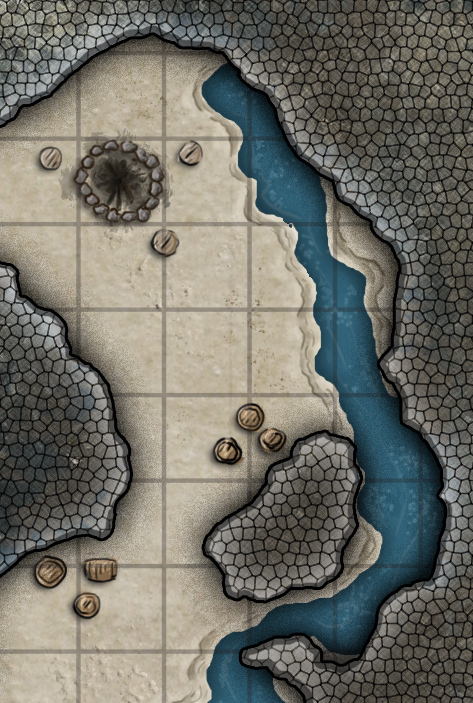 I never use copy & paste with my maps (unless the use of texture patterns for backgrounds count), because I think the effort really shows in the final image. 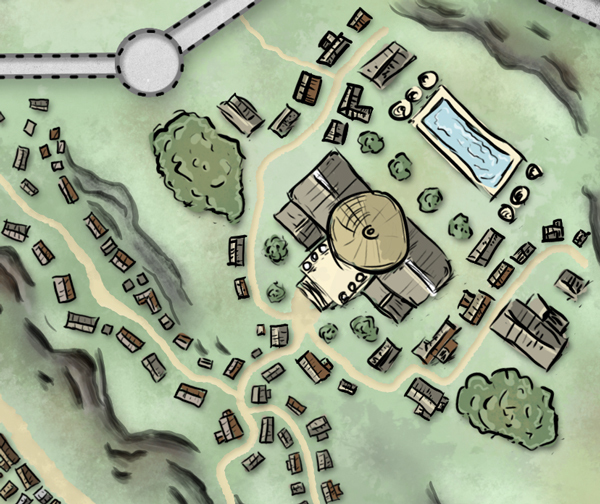 Even when making more digital styled maps I like to make every object individually and not duplicate anything. Copying objects does come to mind when drawing city maps, but I think that the patience to draw every house separately really shows in the end, as seen in the next examples (these are not for Snow White, but from my Rite Map Pack – City by the Sea). 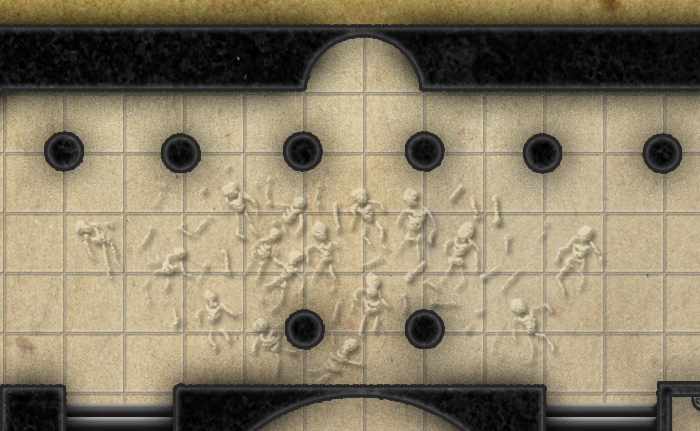 That map is not meant to be looked at that closely, but I want to show on what level I want to detail my maps, even if the details don’t come out very well in the finished piece; the same thing applies to dungeon maps. Little details set the mood—objects on tables, little cracks in the floor, or just texture on the wall, like on the next examples —make a big difference at the end of the day. Details in maps are not only for visual purposes though. 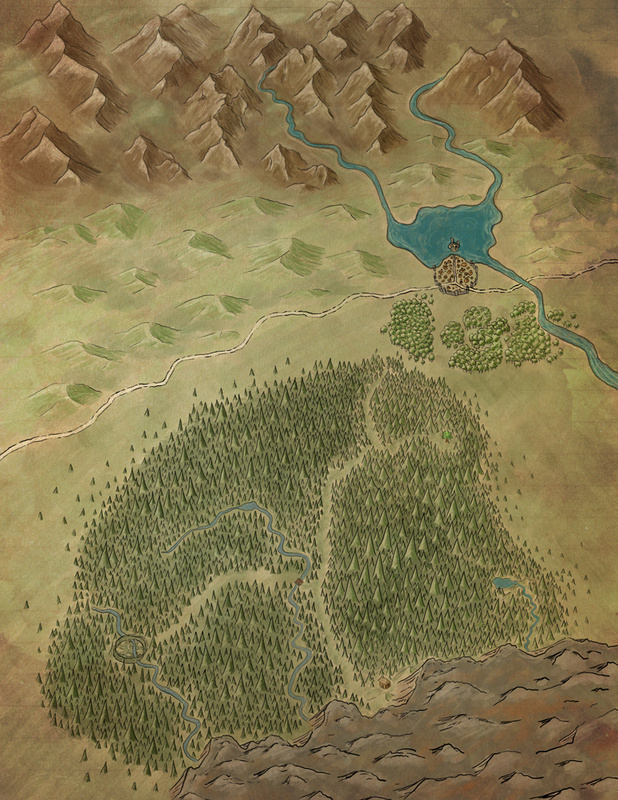 When doing cartography I want to enhance some interesting locations here and there—maybe add some ruins near the mountains, a lonely tower in the middle of the forest, a waterfall in the cliffs, and so on. I think it’s good to have some additional details, not just the ones written in the adventure or source book, but something that gets the gamemaster’s imagination running. I like to think this encourages GMs to add stories of their own, or helps the PCs see the location as a living, fantastic place of adventure. Of course these are things I need to run by the customer I’m drawing the map for, but usually those extra efforts are well received. 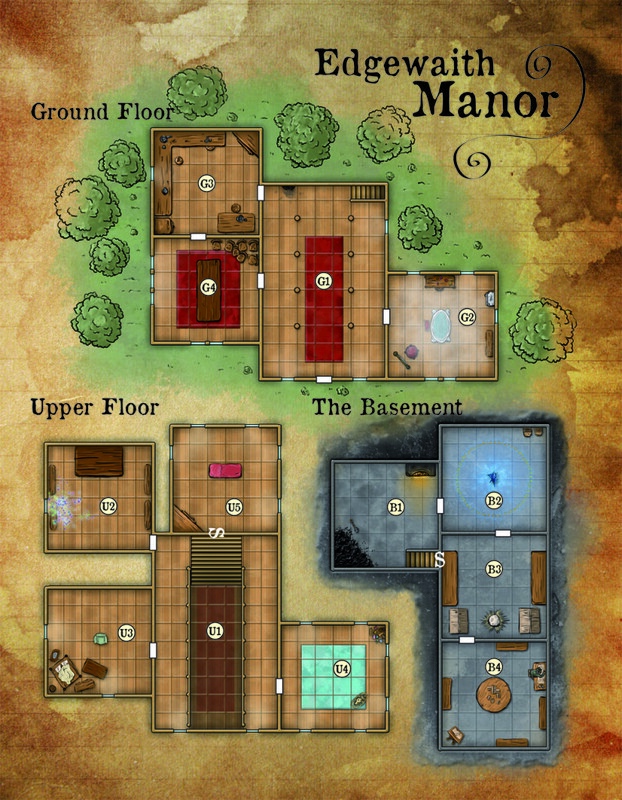 This is a map from “For Rent, Lease or Conquest” (c) AAW Games LLC. I’m really happy to get to work on a project as large and great as Snow White, and I’ll most certainly honor that chance by giving 100% of my effort when making the maps for it. I have a lot of patience stored in me for these pieces, and promise to make them shine! I hope you enjoyed these insights on my approach to cartography. Please go and see the Kickstarter page for Snow White, read some reviews if you’re still undecided on whether to pledge or not—it’s an awesome adventure, and with more of the enthusiastic support the gaming community has shown for it, is bound to get even more amazing! Also feel free to comment on this page, ask away if you have something to ask, or let me know if there’s something you’d like me to write more about. Thanks for reading and farewell everyone! Time for my first blog post ever! Let’s start with the basics. I’m Tommi Salama, a 34 year old graphic designer from Finland. You know, the small cold country in Scandinavia. I’ve been a graphic designer for over ten years now, result of me realizing I’m not going to be a huge movie director, but wanting to do something creative anyway. No worries though, I love my job! A younger version of me. 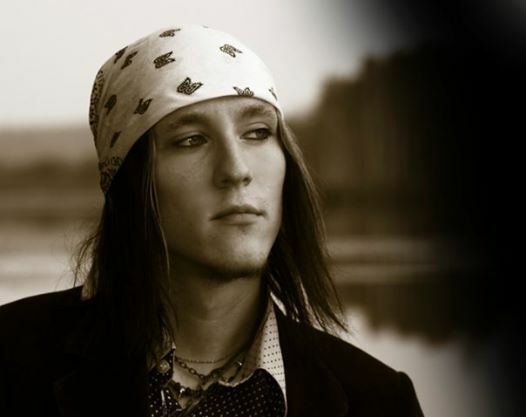 The long hair is gone, but pretty much the same besides that. Now as I said, this is my first blog post. I’m not going to make any plans on how many or how often I’ll be doing this, but what I want to do after this introduction, is to write about how I approach cartography, how I make maps and to talk about products I have worked on. Let’s talk a little about me and how I got where I am now. I’ve been a cartographer for almost a year now. I know it’s a very short time, but I do have years of experience in other graphic designs. 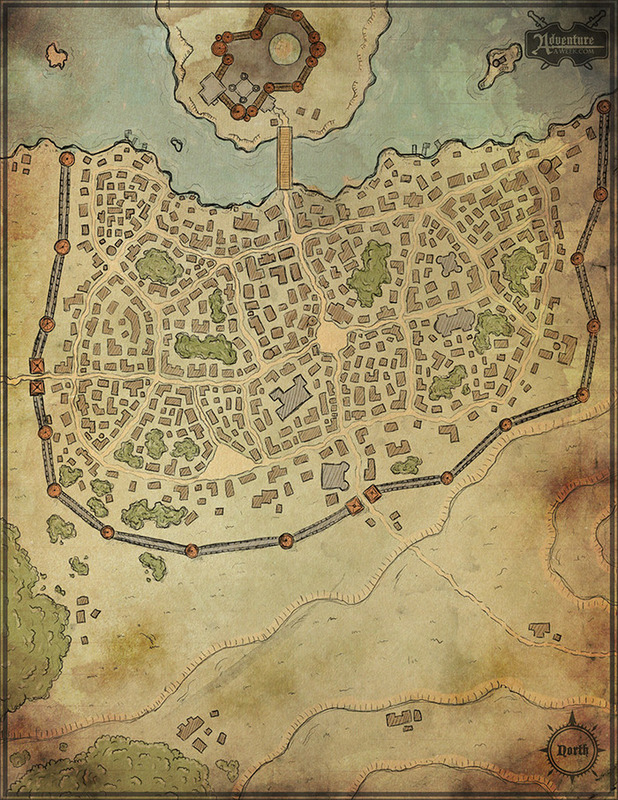 I did do some cartography before that also, but just for my own or my friends games. I’m not sure if I can call myself a professional cartographer yet, but my road to making maps for professionally published products started as a simple thought: “This is fun, I wonder if someone would commission me for making maps for their products?”. 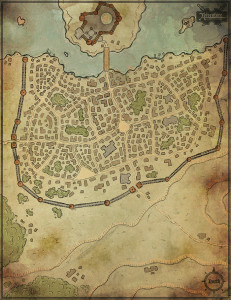 So I went to this awesome forum, Cartographer’s Guild, and looked through the map request subforum. There was a post from Steven D. Russell from Rite Publishing looking for a cartographer for Adventure Quarterly magazine. I sent him an email although I had no prior experience, or even a good portfolio. I just attached some of my old maps and hoped for the best. Right after I sent that email I knew I was never going to get the commission with the samples I sent. Steve was looking for a cartographer for mostly dungeon and encounter maps, and my samples were overland maps. 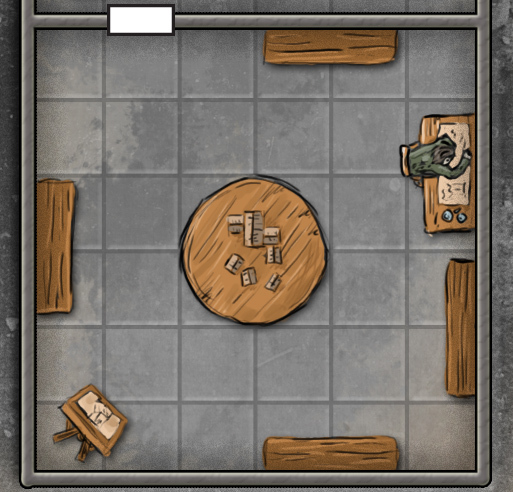 I launched Photoshop and worked all night to make a tavern map with a small dungeon underneath it. I sent the map to Steve next morning, before he even had the time to answer my first mail. I did land the job later on, and Steve was making a huge leap of faith for me, an inexperienced wannabe cartographer looking to get his maps on a published product. I think I owe a LOT to Steve for believing in me and making it possible for me to get in this industry. He also publishes Rite Map Pack line in which I make all kinds of battle maps, and also some larger scale maps for all the GM’s out there. Great man with a great company, I salute you Steve! After my first gig in Adventure Quarterly #5, I continued reading Cartographer’s Guild and sent a bunch of applications for commissions. I got some of them, mostly for gamers looking for maps for their private games, and also some from fantasy fiction writers for maps in their novels. It wasn’t long before Steve contacted me with a job for making an isometric map for a book for Lords of Gossamer and Shadow. 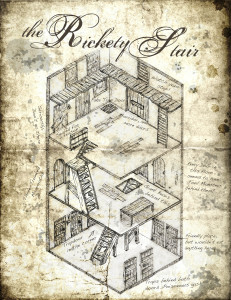 I hadn’t done an isometric map before, but Steve seems to have a habit of trusting me to deliver. I think I did pretty good with that one, especially as I stepped out of my comfort zone and draw it with a pencil rather than Photoshop. I think you really need to step out of your comfort zone as often as you can, that’s the only way to get more creative, and thus better at what you do. In my opinion at least. I had contacted Jonathan G. Nelson from AAW Games based on a post in cartographer’s guild. 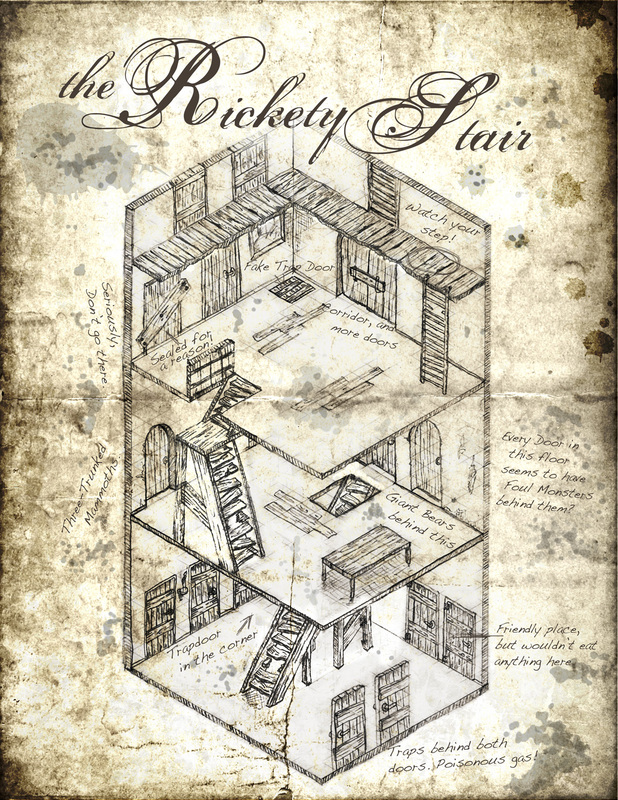 He was looking for a cartographer for Rise of the Drow Epilogue, and even as cartographer for that commission hadn’t been decided yet, he sent me an email with that Rickety stair map attached above asking if that was my work. Now I seem to come across the nicest and most trusting people in this industry, as Jonathan gave me a chance to make an isometric dungeon map for a module that’s a sequel for one of their very first modules, Crypt of the Sunlord. I would really want to show you the map I made, as it’s one of the ones I’m most proud of, but the product is not out yet, so I can’t. Sorry! That map was the beginning of my journey with AAW Games. I’ve made several maps for their products so far, and also done some layout and other things I can help them out with. I feel very lucky that I’ve come across so great and friendly people so far. I salute you too Jonathan my friend! In my first year in this business I’ve also had the honor to work with Creighton Broadhurst from Raging Swan Press (man I love their products, awesome stuff!) and Ron Lundeen from Run Amok Games (super talented! ), both as friendly as it gets. I think I’m off to a very good start! If you managed to read my ramblings this far, I wholeheartedly thank you! Now that I’ve talked enough about myself, I can concentrate on talking about cartography. I’ve been fortunate enough to get to work with Show White from AAW Games, a hardback edition of the wonderful adventure for Pathfinder Roleplaying Game, which is live now in Kickstarter! I’ll get to some details about my part in it in my next post. Until then, farewell everyone!